This rv park is packed . You are very close to the next site . It is on the main road . The owner is starting to update this park. We camped at Hitch-N-Post Campground in a Motorhome. We had a pull thru site. Next site was so close it was impossible to extend our awning. Back-in sites appear to have more room. Sites are level. Close to US89 but noise was not bad. We camped at Hitch-N-Post Campground in a Motorhome. We have stayed here on previous trips and found this to be an ok, but certainly not special rv park. This time our experience was not very good. We arrived around 4:00 and the office was closed and newcomers were advised to use the "night check-in", which basically meant filling out an envelope and enclosing payment. Three pull-thru sites were available on their check-in map. (There were many other empty sites, so I'm not sure why only three were available to use). Although they claim to have a recreation/game room, there isn't anything but an empty space. They also seem to have wi-fi, as I was able to find the network but unable to access it because they did not provide a wi-fi password with their check-in procedure. At first we were worried about not having the access code for the bathrooms, but then realized that the key pads had been disabled and no code was required. Nobody from the office ever bothered to check in with us or have any communication. The rate charged is very high for what you get, but they seem to be aware there aren't many options in this part of the state during the winter months. If there is another place to stay, we will opt for it in the future. I did find out there is an rv park in Richfield, and that's not much further up the road. The sites are fairly narrow and we had a squeeze fitting between the picnic tables. The showers are marginal. Hot water is lukewarm, takes forever to arrive, has low flow and shower stalls have lights with automatic fans. This makes for a very cold showering experience. Best to use your own shower. We camped at Hitch-N-Post Campground in a Motorhome. There was no Wi-Fi on our site and when the owner took a phone call as we were checking in, she told the caller there was no cable but more than twenty TV channels on an antenna. We got two and they were pixelated. The bathrooms were clean but nothing special.. There was no grass anywhere. The rate was more than twice others in the area that were much nicer. If we come back, we will stay elsewhere. We were disappointed and felt this park was overpriced. We camped at Hitch-N-Post Campground in a Motorhome. Clean park close to downtown. Owners very nice and only dealt with the husband. Very personable and helpful. Gravel pads. We camped at Hitch-N-Post Campground in a Fifth Wheel. This park is adequate, but we had problems with the electrical service. We were told that our site would have 50 amp service, but found that it had only 30 amp. In addition, our site and the one next to it were on the same circuit so the circuit breaker would pop several times each evening when both sites were cooking . We were there in November when most of the other area parks were closed for the season. We would not stay in this park again. We camped at Hitch-N-Post Campground in a Fifth Wheel. The access turn is a little tight for big rigs, so we unhooked our tow. Utilities worked well and sites are level. This is a place to park your rig and visit Bryce Canyon. It is not a destination campground. Our view in the front was some on site apartments and from the rear an unkempt home. Wi-Fi was awful. It would be nice if they could put a dog run on site as there is really not good place to walk the dog. We had to take ours to the neighboring hotel to find a little patch of grass. We had no problem with highway noise. Located right in town with short drive to restaurants. 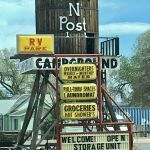 We camped at Hitch-N-Post Campground in a Motorhome.